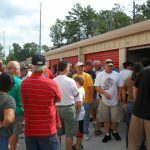 Stop N Stor’s Hinesville Locations Will Be Hosting a Storage Auction! In an open bid auction, participants get a brief amount of time to see the contents of the unit before bidding starts. 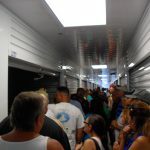 Taking turns to see the contents of an indoor storage unit that is up for auction. Stop N Stor will be hosting a storage auction for our Hinesville locations on Saturday, March 2nd. The proceedings start at 9am at the 245 W General Screven Way location. After the select units have been auctioned off at this location, the auction will proceed to our 746 EG Miles Parkway (Highway 96) location and then to our 1018 West Oglethorpe Highway (Highway 84) location and end the auction at our 1049 Kacey Drive location. The auction is an open bidding system conducted by our auctioneer. 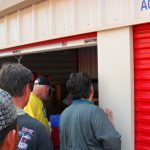 This means that the auction participants can get a brief look at the contents of the storage auction before the bidding starts. The auction is on the entire contents of the storage unit and payment for the unit is by cash only. Please arrive 10-15 minutes early to get signed up for the auction. Stop N Stor management will be available for any questions that you might have during the auction. Don’t forget to bring cash, gloves, a flashlight and a way to remove the items that you have just purchased from the storage unit. The contents of the storage unit have to be removed within 24-48 hours. Keep an eye on our Facebook Page and Twitter Page for more information! See you at the auction! Savannah is home to one of the nation’s biggest St. Patrick’s Day celebrations in the country. Each year, nearly a million people attend Savannah’s St. Patrick’s Day Parade! The St. Patrick’s Day festivities start off in February with the Savannah Irish Festival, which lasts from February 15th through 17th at the Savannah Civic Center in historic downtown Savannah. The festival celebrates Irish culture with food, music, arts and dancing, and is the largest Irish festival in the South. The festival kicks off this Friday, February 15th with a traditional Ceili (Gaelic for party) at the Knights of Columbus hall. The party has musicians, dancing and is a great way to start off the weekend’s celebrations. The Irish Festival has fun for the entire family on Saturday and Sunday. The events run from 10am to 7pm on Saturday and 12 noon to 6 pm on Sunday. There are 4 stages which contain everything from traditional Irish music, Irish dancing and lectures. The Festival Main Stage and the Festival Pub Stage has the top traditional Irish acts and Irish Dancing. Some of the bands and performers that are appearing at the festival include: Rathkeltair Seamus Kennedy, the Cathie Ryan Bank, Dardenells and Harry O’Donoghue. The Children’s Stage has a bouncy house, arts & crafts, face painting and on-going entertainment. The Festival Cultural Stage holds discussions on Irish history, literature and music. Local Irish Dancing Schools, Irish Dancers of Savannah and Glor Na Daire, will be performing throughout the weekend. Savannah’s 189th Annual St. Patrick’s Day celebration will take place on March 16, 2013! Start off the celebrations and immerse yourself in Irish culture in February at the Savannah Irish Festival! Stay tuned to Stop N Stor’s Facebook and Twitter pages and this blog to keep up-to-date on events in the Savannah area.